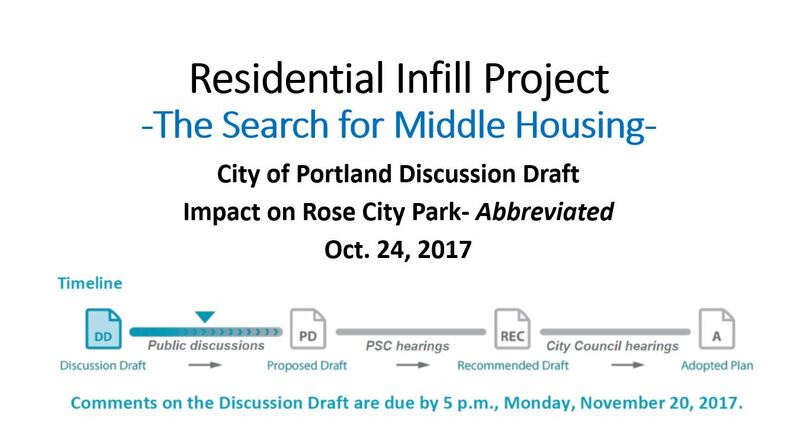 The RCPNA Chair Tamara DeRidder presented the following at our latest General Meeting, outlining some definitions and impacts of the latest zoning changes planned by the City of Portland for Rose City Park. Click RCPNA Residential Infill Project10242017-2 to download this full presentation. In reading staff report 1 they refer to historical small lots. Although the Rose City plat was 2500 sq ft lots all the homes I am awear of were built on 2-5 lots. No homes were built on one 2500 ft lots. The historically accurate fact is homes were built on 5000 Sw ft lots or more. I have been in the neighborhood since 1951. The staff in historically wrong through lack of knowledge or purposeful twisting of the facts to support there end game. Once the Cityis full, it is full go start a new city or build New York 80 story buildings down town. Oh that’s right. We can’t block west hill views so let’s destroy the character of our Eastside neighborhoods.